Following today’s publication of an official notice update by EURid (the registry in charge of .EU domains), the various scenarios listed below have been suspended for the time being. We will keep you informed as the situation evolves. On 28 March 2018, the European Commission informed registrants of .eu domain names (both individuals as well as companies) that they will no longer be able to register or renew .eu domain names if they do not reside within the European Union. 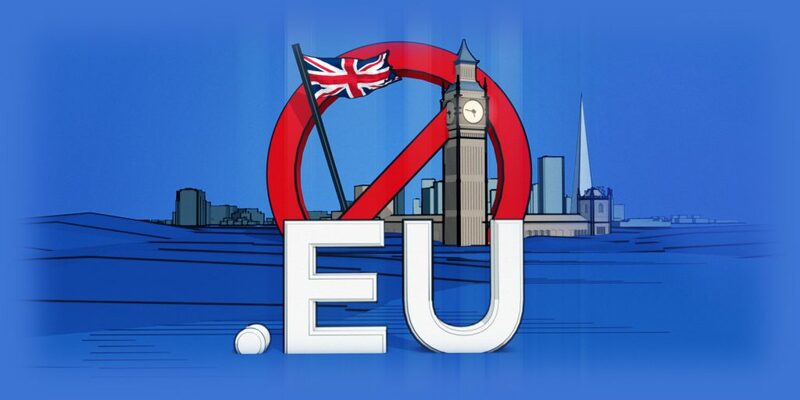 The Brexit date—31 March 2019—is approaching quickly, and so the European Commission asked EURid, the registry in charge of .eu domains (https://eurid.eu/en/register-a-eu-domain/brexit-notice/) to prepare an action plan for .eu domain owners who reside in the United Kingdom. As such, EURid has made plans for two possible scenarios, depending on whether the United Kingdom and the European Union reach a deal. EURid will no longer authorise the registration of .eu domains to any owner with an address in the United Kingdom (country code GB) or in Gibraltar (country code GI). EURid will send a notification via email to all .eu domain owners with postal addresses in the UK or Gibraltar. This email will inform them that the registration data associated to their domain name no longer conforms with the rules for .eu domains. EURid will send a second notification via email regarding the non-conformity of their registration information. A two-month grace period (that is, until 30 May 2019), will be provided for them to update their registration information in order to conform with the registration requirements for .eu domains. During this two-month period, all domains will remain active. >> “WITHDRAW,” status. The domain name will stop working, though there will still be the possibility of reactivating it if the data is brought to conformity before 30 May 2020. Beyond that date, the domain name will be deleted and will be available for new registration. If the order is to transfer the domain to an eligible owner, the domain will be reactivated. If the order requires that the domain name remain registered to an non-eligible owner, the “WITHDRAWN” status will be applied to the domain name, as described above. >> “SUSPENDED,” status. EURid is evaluating the owner’s special request and it may result in the deletion of the domain name (actions described in 1. above apply). >> “QUARANTINE,” status. Owner change operations on the domain name are forbidden. However, owner changes to a registrant located in the European Union is authorised. Starting 1 January 2020, EURid will no longer authorise the registration of .eu domain names to any owner with a street address located in the United Kingdom (country code GB) or in Gibraltar (country code GI). EURid will send an initial email notifying owners of domains with non-compliant registration data. EURid will send a second notification email. Domain owners will have the opportunity to update their registration information to bring them into conformity with EURid’s requirements. During this two-month period, domain names remain active. All domain names for which the owner has not demonstrated eligibility will be deleted. All domain names deleted previously will become available for registration. With Brexit and its consequences on .eu domains, residents of the UK are asked to reconsider their domain name strategy, notablly to strengthen the protection of their brand names and avoid risks such as cyber-squatting, particularly on the part of EU residents who do meet the registration requirements for .eu domains. Gandi is committed to helping out our UK customers during this transitional phase and we remain at your disposal if you have any questions or difficulties.